How can Nigeria manage her recession? Nigeria will have to turn to industries other than oil to help pull itself out of recession, experts say, as the latest sobering government figures reveal that the economy fell by just over 2 percent in the second quarter. 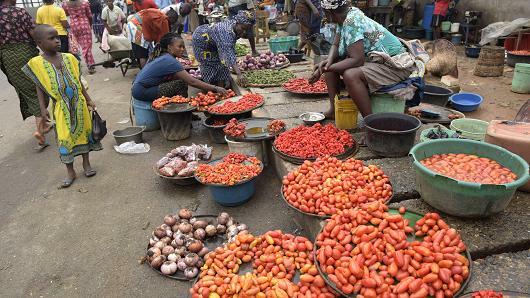 The overall decline of Nigeria's economy is - gross domestic product (GDP) fell 2.06 percent in the second quarter - largely attributed to the global drop in the price of oil, which saw growth of -17.48 percent in real terms in the same period. IMF data projects a -1.8 percent change in real GDP for 2016. This would be the first annual decline in over twenty years, and the worst annual recession to have hit the country since 1987, when GDP growth dropped to -10.8 percent. But, as dark clouds threaten, how will the country cope? After the bad economic news was delivered, Nigeria's finance minister Kemi Adeosun announced that the government had approved a three-year plan to borrow more from abroad, Reuters reported. She also said that Nigeria had to tackle structural problems that had stoked inflation and that interest rate hikes were not the answer. The government has so far spent more than 400 billion naira in capital expenditure this year, part of a record 6.06 trillion naira ($30 billion) budget for 2016, Adeosun said last week - as reported by Reuters. Nigeria plans to borrow as much as $10 billion from debt markets, with about half of that coming from foreign sources. Funds from this Eurobond would be spent on power transmission projects, solid mineral development and agriculture. The medium-term borrowing plan, which covers 2016-2019, will now be sent to parliament for approval, Reuters reported. Nigeria's finance minister stressed the importance of diversifying the economy. "We have to grow our non-oil economy," she said, according to Reuters. According to a note by Renaissance Capital, agriculture and telecoms are two of the bigger economic sectors which saw growth in the second quarter of this year, though this was slower than previously. Agriculture, which accounts for one fifth of Nigeria's GDP, saw growth of 2.5 percent in the second quarter of this year, said Renaissance Capital's note. But, while this was down 0.7 percent year on year, Yvonne Mhango, a Sub-Saharan Africa economist behind Renaissance Capital's note, told CNBC via telephone that the organisation was "not expecting negative territory for crop production." As for the promise of telecoms, Mhango explained that the sector was "still growing." Nigeria's services sector, which is worth 50 percent of GDP, shrank by 1.3 percent year on year in the second quarter of 2016, according to Renaissance Capital's note. The sector's decline can partly be attributed to zero percent year-on-year growth of its largest subsector, wholesale and retail trade, explained the note. But, Mhango was positive, and said that the second quarter "was the first time services saw a contraction," and because "its decline is not as deep [as elsewhere] – it has the best prospect of recovering." With regards to Facebook chief executive Mark Zuckerberg's visit to Nigerian tech start-ups last week, Mhango was also upbeat, and explained that in Nigeria's current climate of a squeezed job market and high unemployment, tech "allows for entrepreneurs to exist," which is "great in terms of [allowing them to] generate more income for themselves." Reuters and CNBC contributed to this report.